Today I thought I would share with you some photographs and videos I took in Bulgaria while away at Christmas. I know many people talk about the Bulgarian property market and how cheap it is so I thought (for those of you have not been) I would share a few snaps I took. 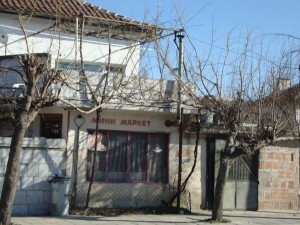 Property in Bulgaria can be bought very cheap. And the mentality of many British investors is “property is so cheap I cannot lose”. Well let us not forget that Bulgaria in many parts of the country is incredibly poor, people use donkeys rather than cars, unemployment is around 80% and running water is a luxury not a basic. So when we talk about cheap we do need to remember the levels of poverty we are talking about. For instance – how would you like this “supermarket” as your local to buy your weekly shop? Or how about this restaurant when you fancy a night out? Does is still look cheap now? 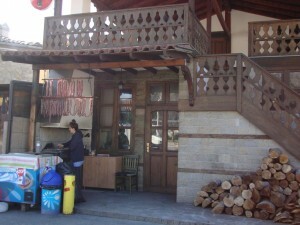 Would you really still buy a house in the Bulgarian outback for £10k and still think you got a bargain? At the very least, if you are thinking of buying property abroad at least visit the country. I know so many investors who thought they bought “cheap” in Bulgaria – they have now written off the money they invested. They have realised they will not rent it, not sell it and wish to God they had never bought it. That makes the “cheap” buy an expensive mistake. Cheap property can be great – but make sure you know why it’s cheap and your exit plan….because the parody of cheap property is that it can also be expensive! I think also another thing that one really has to consider is; if you are a non-resident of a country do you have the same property rights, or what are your rights if it all goes wrong. In the UK there are many laws to protect the buyer and seller, event then things do go wrong. Also you are dealing with a foreign language, so is a technical translation correct? You are very right – the risks involved are tremendous. People seem to think everywhere works like Britain – look at the stories we hear of people who have bought in Northern Cyprus (and to a lesser extent Spain) and then had their homes taken off them legally. I have some experience with Bulgaria. A good friend of mine purchased a few properties over there (against my advice I hasten to add). He brought four new builds in various parts of the country. The story is a long one, so summarised it goes like this. One has been built had holiday tennants for 12 months and provided income (part of the purchase deal), since then it has hadn’t had any holiday tenants and remains on the market, property 2 remains a hole in ground (written off), property 3 is half built (also written off) and property 4 is built, but legal wrangles mean it cannot be used (basically builder won’t release as someone run off with a bucket full of cash). Did your friend ever visit the country? Hello Sam totally off topic, but thought that I might suggest that you get an avatar? This way when you post on other blogs you will have a distinctive image with your post. Great post and something I always have to remind clients. Houses, whether they are in the UK or in foreign climates are cheap for a reason. Bulgaria is a particularly poor example though, in the right location, there have been some successes. However, there hasn’t been enough successes for people to trust the market place. This is why there has been a real rush back to the traditional market places in the last year. Countries like Spain and Italy in particular have seen large rises in interest. Thanks James – do you find the fear of possible Euro debt (esp. in Portugal and Spain) is causing any buyer reluctance at the moment? but not much luck or perhaps it was luck that I didn`t actually manage to get one, after reading you`re reports. selling, or having their homes repossessed? Sylvia – that’s very interesting you were bidding for property in Bulgaria – I had seen properties advertised there. Had you seen the property in question? How does it work when you buy property over ebay – is it a binding contract still? I’ve bought in Bulgaria. Lost a bit of money (ok then, quite a lot) due to a swinging exchange rate and the 12.5% VAT on new builds. Still, the property is relatively resalable. I’m probably losing £2k a year on a repayment mortgage so I’m making it a plan to visit two or three times a year (basically working away from home, in the sun). The apartment is costal, with a large balcony, in a well developed resort with no crime issues (it won’t have, as the developers are basically “connected” if you get my drift). My main hope is exchange rates swing round – the debt is in euros so a 1.4 rate would be great! I did look at traditional housing and it was exactly as Sam described above – we saw looks of befuddlement from the locals as they saw us view the properties – real outback stuff. 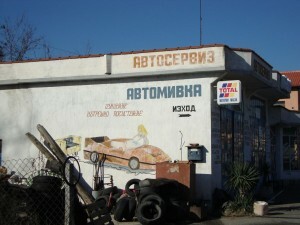 When you go into the interior of Bulgaria you realise how poor it is. Simon, thanks for sharing your experience. I think it sounds like a great plan to start visiting more and try and get more out of your purchase. Do you rent it out at all – or is there not a market for holiday lets? Yes exactly there is a difference between cheap, average and expensive, if you honestly think you will get a mansion on a range in a city for 10 000 EUR you are mistaken. You know what they say you get what you pay for. However I don’t think I can trust your polarized view of the country. There is a big difference between rural villages and cities. In rural villages in the middle of nowhere you will find the donkey carts, the shabby shops, no running water or electricity, and no sewer system (although most villages in BG have recently installed the basic necessities). 80% unemployment is a highly inflated figure, its closer to 40% still not good. I would not recommend any Brit to buy a cheap house in a village (e.g Kralevo), in fact you must be an idiot to buy a house which you have not seen and of which you have no knowledge of the area. A better investment would be in the city (e.g Varna, Sofia) where you have the shopping malls, the motorways with the cars, and the running water, electricity and sewer system, where prices are not cheap but cheaper than the UK. Thankfully the property in BG market is not booming and prices are staying what they are, otherwise I would never be able to afford the coastal summer villa I currently own in Sunny Beach. Jay, thanks for your comments. The post here describes my rural drive through BG as we were driving from Greece. When you purchase in Bulgaria the Notary will check that the land and property is free from debt and can be legally sold before allowing the sale to proceed. EU citizens have the same rights as Bulgarian’s now, previously foreign nationals buying land or property needed to set up a Limited Company to buy. You sign all documents in the Bulgarian format, so if you’re not fluent in Bulgarian you will require a certified translator to be present. From what I can tell the cheaper end of the properties for sale on eBay seem to not currently be lived in, it tends to be property that has been inherited. Bulgaria is one of the countries suffering from a decreasing population, many of the younger generation have travelled to other EU countries in search of work, the native Bulgarian’s are not reproducing at a rate high enough to replace the current population so many villages do tend to have an aging population. Some of the more expensive properties on eBay are being sold by Brits because the owners wish to return to the UK, often taking a big loss on what they’ve spent. I’m not saying this to put people off, just making people aware of some of the reasons why property is cheap. It’s not put me off buying. I think if you’re buying for yourself to enjoy not an investment so long as you don’t pay too much you’ll be OK. If you’re buying for investment you will probably be waiting a long time to realise a return. The Summer season is only short in Bulgaria so even in Varna/Burgas it would be hard to rent a good quality property out year round. Same with the ski resort properties. 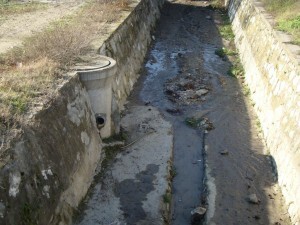 Bulgaria is a beautiful country, despite the evident poverty in some places. We’ve always found the people to be very nice. It’s also worth mentioning that not everybody in Bulgaria is poor, there are some properties in my village that are very nice indeed, they have new Mercedes parked on their drives, and as far as I’m aware I’m the only British person that owns in my village. Thanks for sharing. Your story is interesting. Would love to see some photos of house bought on your blog and hear more about how you get on with refurb and how much jobs cost over there.